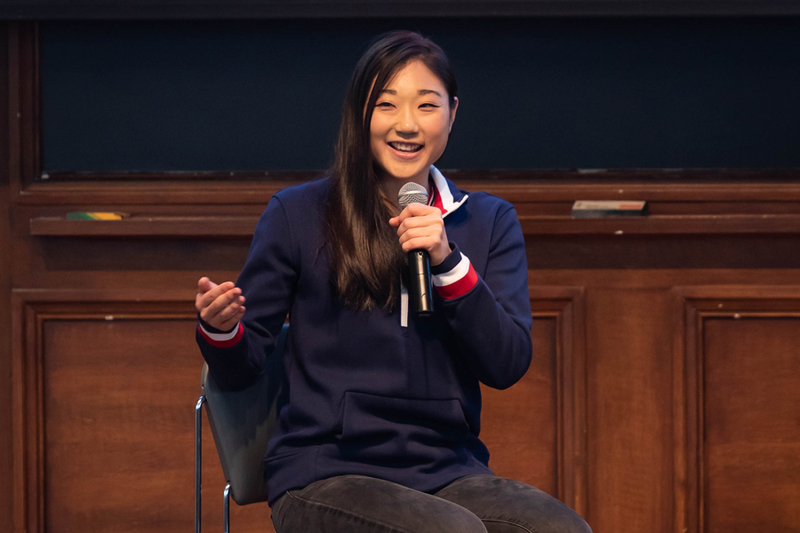 When figure skater Mirai Nagasu was about to face the judges at the U.S. National Championships in January, she needed to quiet the voice in her own head that told her she wouldn’t make the Olympic team. It worked. Nagasu placed second, securing herself a spot on the U.S. Olympic team. As the Chinese Students Association’s fall speaker, Nagasu spoke to an audience of over 150 in Harris Hall on Saturday. She touched on her journey as an Asian American woman in figure skating, and how she has dealt with career setbacks. In February 2018, Nagasu became the first American woman to land a triple axel at the Olympics, a jump that helped her and her teammates secure a bronze medal in the figure skating team event. Nagasu said landing the jump is one of the proudest achievements of her life, especially because she was in pain during the entire competition. She was skating at the Olympics with an injured hip and she said it was crucial that the media and judges were left unaware, lest they score her with the injury in mind. It’s situations like these, Nagasu said — where athletes aren’t able to be fully open, especially in a judged sport — which she wants to raise awareness about. She said her parents, who immigrated to the United States from Japan, raised her to be quiet, accept hardships, take the hits and work hard. That mentality followed her to Nationals in 2014, where she received a bronze medal. Typically, the top three skaters from that competition go to the Olympics, but the fourth-place medalist, Ashley Wagner, was selected to go instead. After being left off the team in 2014, Nagasu said she was in a “dark place,” but the setback motivated her to work even harder to compete at the next Olympic Games. She said her work ethic is something she learned from her parents at a young age. Skating is an expensive sport, and Nagasu said her family often struggled with the cost. She said her parents kept reminding her of how much money they were investing and telling her to focus on training. Ultimately, Nagasu said, that “helicopter” behavior is what instilled in her the drive she has today. Nagasu said she wants to stay involved with skating in shows and maybe coaching. Now, she’s sharing her story with audiences like the one at Northwestern, hoping to encourage people to pursue their dreams. McCormick freshman Catherine Chen, also said she appreciated how candid and “down to earth” Nagasu was about her story. “It’s very eye-opening, that she’s so successful, and that she still has … very similar roots and background (to me),” Chen said.